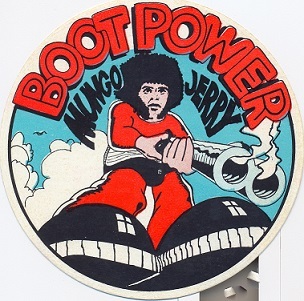 Boot Power was the fourth Mungo Jerry’s studio album to be released in the Autumn of 1972, and the first by Ray Dorset, the songwriter, and Mungo Jerry, the performer. Pianist, Colin Earl and banjoist, Paul King having left to form their own group, the King Earl Boogie Band. 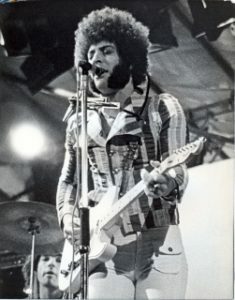 Mungo Jerry, for the first time, with a drummer and had a harder-rocking sound, came up with what many fans believe to be the finest of all Mungo albums, containing classics such as, My Girl & Me and the autobiographical 46 & On. Tracks: Open Up/She’s Gone/Looking For My Girl/See You Again/The Demon/My Girl & Me/Sweet Mary Jane/Lady Rose/Goin Down The Dusty Road/Brand New Car/46 & On. “Obviously I love them all, but these two stand out for me. Many a long nights drive was improved immensely in recent years by these two pounding away full blast on the in-car CD player. 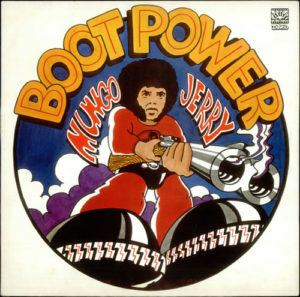 Ray Dorset has written and co-produced this new Mungo Jerry album and it’s a strong musical offering from the band. 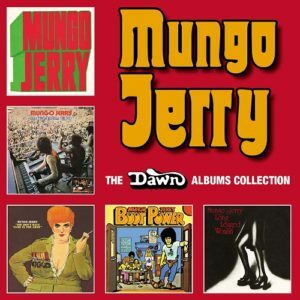 There are 11 tracks that display the range of Mungo Jerry and it must surely be well received by their many fans. This a kind of sad album. In student days of ’70 and ’71, it was quite a buzz to go down to the pub, get totally wrecked on cider, put every single Mungo Jerry record on the jukebox, stomp feet and chant along, if a trifle erratically. 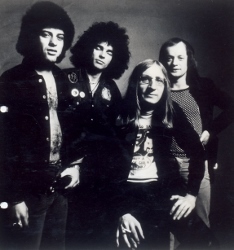 But by then, the band became a full-tilt Ray Dorset ego boogie and that particular Mungo Jerry charm just melted away. 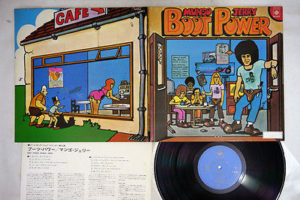 The cover of’Boot Power depicts Dorset on the fold-out as Dennis The Menace, and Mungo Jerry as Clockwork Orange types on the front. The songs find Ray tackling heavier topics than in the old days in a more conventional electric rock style. The trouble is that a charming but slight talent has strayed into areas which have effectively erased his charm and left the slightness bared. Sad, but nothing lasts forever. Charles Shaar Murray, NME, 1972. 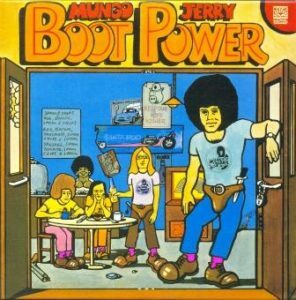 Mungo Jerry’s next album, Boot Power should surprise a lot of people. It’s got plenty of variety, a lot of surprises and a wedge of potential singles, though Ray is going to record a single later in October, probably at the same time as the album. SEE YOU AGAIN…“I’ve cheated and used one of the song titles from this very good album for the title to this review, the first after the split of the original (and still the best) line-up. Seems fitting as I did not expect to hear from them again. “This album is a complete change of style and unexpectedly I warmed to it immediately. Not too sure about the new version of Lady Rose though as the original was just so good, but it is a grower. That cannot really be said for the new version of Open Up though, hence the 4 stars. “Stand out tracks have to be Brand New Car and the semi-biographical 46 and On. Had the single (My Girl and Me) benefited from more airplay it would surely have been another hit. Perhaps it would have been if it had actually been released in the summer? Looking For My Girl has some great stereo. 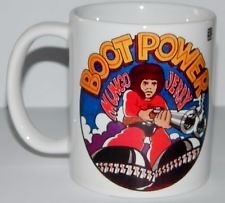 Only down side is the fact that mostly the songs are not so instantly recognisable as Mungo Jerry and they do not have that catchy sing along appeal. “In the good old vinyl days this was their last studio album for the Dawn label after which they moved to Polydor, where the rockier style continued and matured. GOOD ALBUM…“May not have a lot of hits but all of the songs are good. It’s a very solid album. 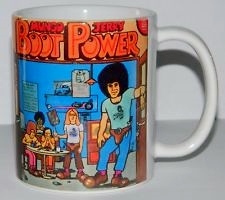 The replacement Boot Power sleeve. “If you like a touch of psychedelia check out the brilliant version of my song The Demon from the Boot Power album on YouTube by Ex Norwegian”.